Jinji Lake is a branch of Taihu Lake. 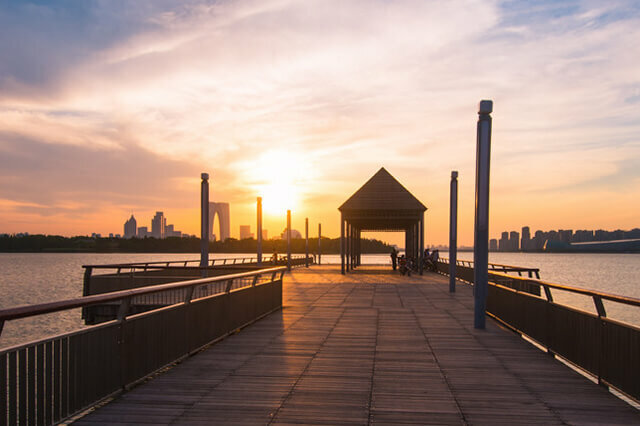 The scenic spot is located in Suzhou City, Jiangsu Province and it is the national AAAAA scenic spot with a total area of 11.5 square kilometers. It is the largest urban lake park in China at present. The extremely well-known city, Suzhou, in most cases, has been a representative of the Jiangnan scenery of “antique beauty” in the mind of travelers. Compared to the ancient town, the skyscrapers and modernization has shown another side of Suzhou. Jinji Lake Scenic Spot contains five major functional zones of cultural convention and exhibition zone, fashion shopping zone, leisure and food zone, urban sight seeing zone and central water scenic zone, which can bring people enjoyment of variety of modern tourism of culture, fashion, leisure, entertainment, food and so on . 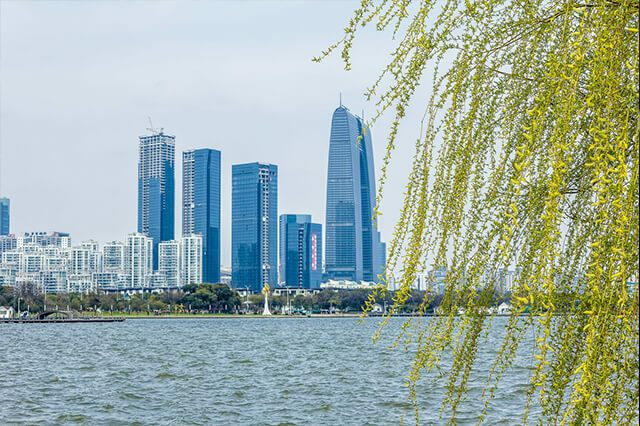 Jinji Lake Scenic Spot owns eight major landscapes, respectively they are “Hubin Road”, “Urban Square”, “Water Lane Neighborhood”, “Wanghu Corner”, “Jinji Mound”, “Cultural Corridor on Water”, “Linglong Bay” and “Boxin Island”. Roaming in these places, you can feel the colorful charm here from different angles. You can also have a picnic, fly a kite in the grass by the lake, or cycle around the lake, take a walk to enjoy the relaxing leisure time. In spring, you can take a boat to the Peach Blossom Island in the heart of the lake to have a look. Every peach blossom season, the whole Peach Blossom Island is bright red all over the sky.